I’m a little late in getting this post written, but I wanted to be sure to let all my readers know about two very good books I read recently. 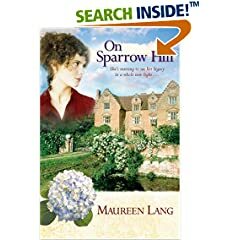 On Sparrow Hill by Maureen Long is the second book in her series, The Oak Leaves. I will admit that I didn’t read the first one when Ms. Long was gracious enough to add me to her “influencers” list and I got my copy of On Sparrow Hill directly from the publisher, but even so, I had no trouble enjoying this book thoroughly. I could tell there was a story before this one, but rather than making me feel I was missing something, it made me want to read the first one, just to see how they fit together. As the commercial manager for Quentin Hollinworth’s family estate, Rebecca Seabrooke is focused on just two things: making hers the most successful historic home in the country and forgetting the childhood crush shes had on Quentin since her father worked as his family’s valet. After all, they don’t exactly run in the same social circles. But when she and Quentin uncover letters in the family vault written over 150 years ago by Berrie Hamilton, one of Quentin’s ancestors, Rebecca discovers that Quentin isn’t the only one with a legacy to appreciate. Only Berrie’s words can prepare Rebecca for the dramatic turn her life is about to take. Ms. Long skillfully weaves the stories of the past and the present together, using Berrie’s letters to seque into Berrie’s point of view. An inherited disability affects both the past and the present and the letters help Rebecca not only advise a new friend on faith and trust but help her see that Quentin’s social standing and the gossip of tabloids need not be obstacles to happiness. This is a lovely, special book for anyone who loves romance, family and stories of faith tested and faith triumphant. 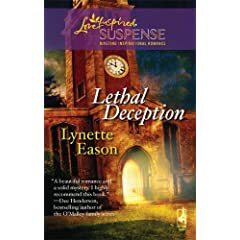 The next book I want to bring to your attention is Lethal Deception by Lynette Eason. Cassidy McKnight, daughter of an ambassador who is deeply involved in fighting against the crime of human trafficking, is kidnapped in South America, where she went to claim guardianship of the daughter of two missionary friends who were killed. Cassidy’s father hires Gabe Sinclair, a former SEAL with a secret in his past that concerns Cassidy’s brother. Gabe rescues Cassidy and brings her and the toddler, Alexis, home and plans to go back to his own life. However, the danger to Cassidy isn’t over even after her kidnapper in South America is behind bars. Someone is still trying to kill Cassidy and possibly Lexie. Gabe can’t let that happen and his feelings for Cassidy war with this desire to keep his secret hidden.Is he willing to risk her disdain to tell the truth or will he let his renewed faith in God carry him through whatever happens? Lethal Deception is an exciting book, but also one that will touch your heart. Cassidy and Gabe’s interaction with Lexie is priceless and the twists in the story will keep you reading. Just when you think you know all the answers, something new pops up and makes you ask yourself how you missed those clues. Thanks for reviewing On Sparrow Hill! I’m so glad you enjoyed it, and equally glad you mentioned it’s not necessary to have read The Oak Leaves in order to enjoy this one. That was my goal, so I’m glad it worked. And Happy Birthday (a little late)!